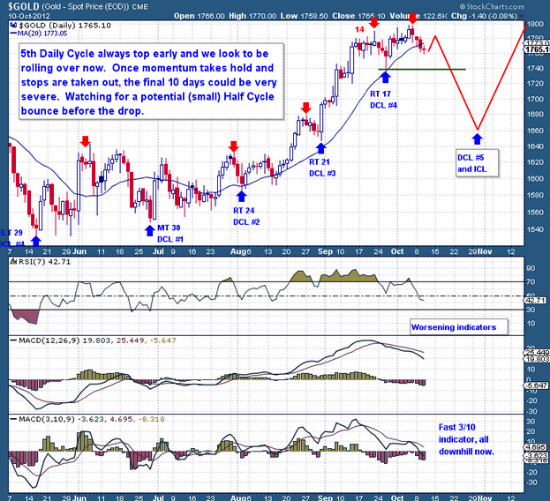 The Gold Cycle looks fairly easy to read; once you strip out any biases you may carry. Quite simply, it’s screaming Investor Cycle top and warning of a significant decline. Sure when viewed through the idea of endless printing and world crises’, one could easily suggest or envision much higher prices before any significant pullback. This type of thinking is actually what drives IC tops, an unrelenting belief that a Cycle will continue higher based on short term speculative interest and a fear of missing another move. But the facts are that we’re very deep in the timing band for an IC top, we have a very bearish COT report, extreme (bearish) sentiment, and a series of technical indicators and oscillators that are at levels seen during IC Tops. Whenever these sets of conditions have presented themselves together, it has almost always resulted in a significant top. The only exceptions have been the 5 blow-off C-Wave tops, and that’s very far from where we stand with this Cycle. Could it be different this time? Certainly it’s possible; I tend to steer clear of absolute statements or beliefs. Now on Day 11, it would be highly unusual for Gold to make a new DC high this late in a 5th Daily Cycle. The longest a (5th) Cycle has gone before a top is just 12 days, so based on this history we can assume that the high set on Day 7 at $1,798 will remain the 5th DC top, and therefore the Investor Cycle Top too. With this in mind, at the very minimum a Daily Cycle failure is expected (below $1,738), with an expectations of greater declines, likely below the $1,700 level. The miners are following the script I’ve outlined for some weeks now. Since the weekend report, the 10 and 20 dma were lost on a closing basis and the lower trend-line was breached. 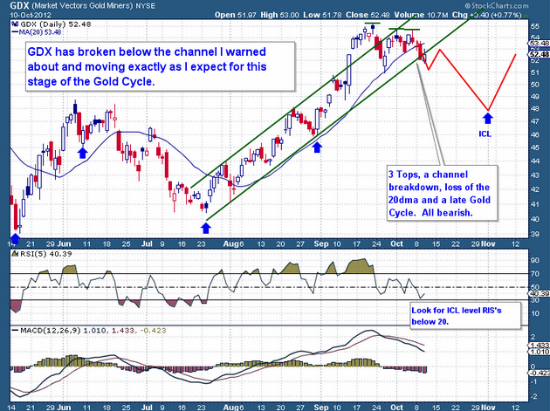 The miners are closer to showing a Cycle failure than gold is, as a move below the Sep 26th lows would set the scene for a decent drop into an ICL. I really do not have too much more to add regarding our gold framework, I believe I have presented over many weeks a very clear and consistent framework for a coming ICL. As members of this service you all need to plan and act accordingly, I have provided you with a road-map of how I plan to trade this coming period. In the event the framework is wrong and a new upside move above $1,800 takes hold, then a) We still have a decent positions to profit from b) I will likely initiate new trades very quickly above $1,800. This as is an excerpt from the premium mid-week report from the The Financial Tap. Dedicated to helping people learn to grow into successful investors by providing cycle research on multiple markets delivered twice weekly, as well as real time trade alerts to profit from market inefficiencies. They offer a FREE 15-day trial where you’ll receive complete access to the entire site. Coupon code (ZEN) saves you 15%.